I’ve added three new images to RedBubble. These are all from paintings I’ve done based on places in Nova Scotia, Canada. Just click on them and it will take you right to the link…hopefully, :^) Thanks for visiting and I have something new to post soon. Enjoy! Not long ago a blogger I follow posted a beautiful picture of a starfish placed on an abstract background which she had painted. ( you can view it here Starry-Eyed )It evoked pleasant memories of vacation times that me and my family spent at Lockeport, Nova Scotia. 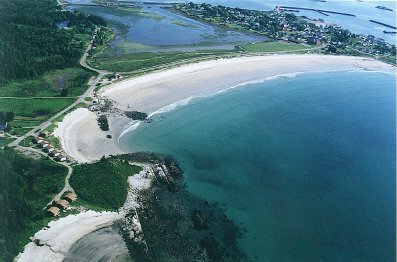 This is a beautiful beach but tends to be pretty cold even in the summer time. We like to stay at the cabins that are there. Our favorite cabin is called Sand Dollar. It may be basically all the same for each cabin but in the one we are familiar with there was this little shadow box on the shelf with a starfish in it and some old ocean themed books. When I saw The Wandering Youth’s post it brought back great memories . So since this blog is about my art I thought I would share the above painting of Crescent Beach that I did on canvas. It’s a beautiful beach ( if you don’t mind cold water,ha- invigorating though). It’s brilliant white fine sand has really defined for me what a true beach should be. It glistens like snow on a bright sunny day. Hey we’ve even had some fun on a misty dark night with a campfire right on the beach! Also the little isthmus town of Lockeport has a restaurant that boasts the best fresh lobster sandwiches. Lockeport is , after all, an old fishing town. It’s a great place to visit if you really want to get away from it all. 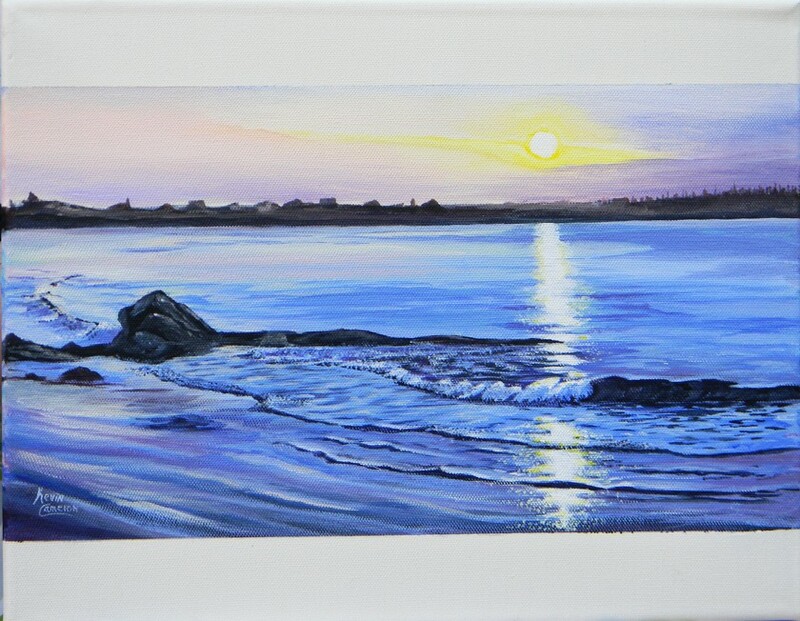 Below is another painting I did of Crescent Beach at Sunset a while back. Think I’ll do a daytime painting of the beach soon.